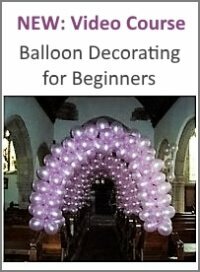 The balloon column (also called balloon tower or pillar) is possibly the most impressive part of your balloon display... and the most difficult to build, you might think. True, it's not a piece of cake, but we'll show you step by step that it's completely do-able, even for a 'newbie.' And the result is certainly worth the effort! So, let's roll up our sleeves and get started! 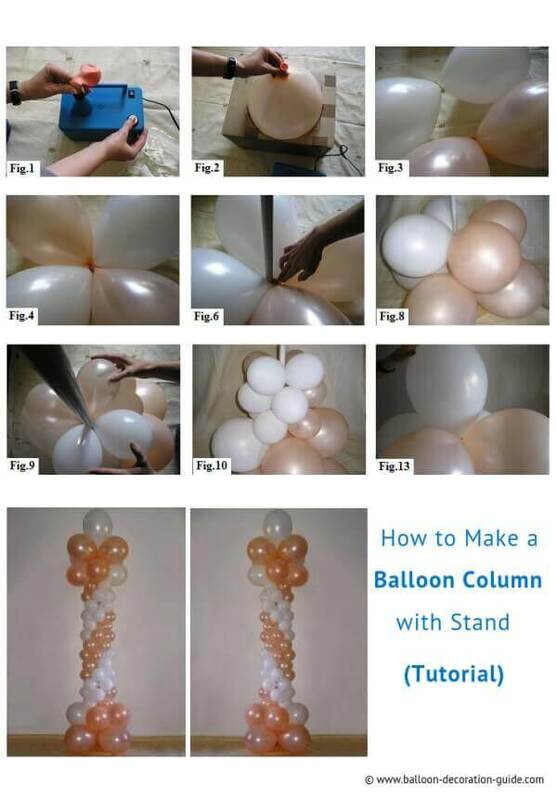 If you like this balloon column tutorial, please share it on Pinterest! For a balloon tower of 7'3" (2,2 m) height you'll need a stand of 6'2" (1,88 m), 17 11" balloons (9 white, 8 pearl) and 52 5" balloons (26 white, 26 pearl). Make sure you have some extra balloons in case any should burst. 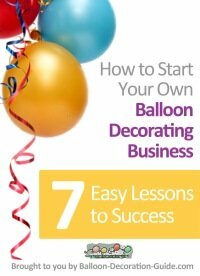 If this balloon sculpture will be the only air filled balloon decoration you'll ever make, then you might want to rent an inflator instead of buying one. 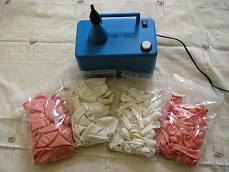 Check out specialized balloon suppliers in your area and ask whether they offer inflators for rent. 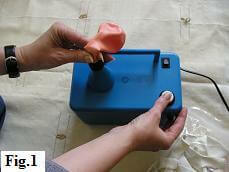 Alternatively, gather friends and family together to help you blowing up balloons manually ... or rather "mouthually"! 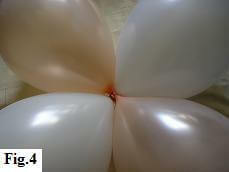 Take four 11" balloons, two of each color, and begin inflating them (fig. 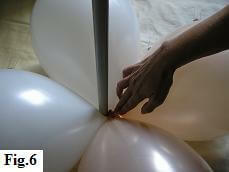 1), using your balloon sizer to make sure that they are all a uniform size (fig. 2). Tie them in clusters of two (fig. 3). Note: The professional way is to tie off the first balloon, inflate the second and knot it directly to the neck of the first balloon. However, you may find that you lose air as you do this. 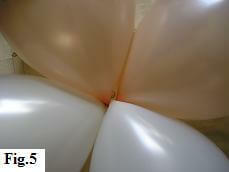 Alternatively you could knot both balloons and then tie them together. There really is no easy way to do this, but with practice it will become easier. 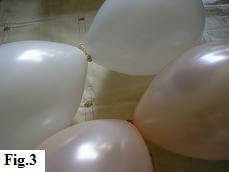 Now cross the two pairs of balloons (fig. 4), and then twist them around once, so that you have both colors directly opposing each other (fig. 5). This first cluster can now be put in position at the base of your stand (fig. 6). Position the balloons so that the conduit is between two of them and simply push the cluster onto it, until it's in contact with the knots in the middle. You'll find that it's such a snug fit that the balloons are self-securing. This technique will be used for all the clusters of the column. To avoid confusion, once you begin constructing the spiral, always pass the conduit between the two white balloons of every new cluster that you attach. 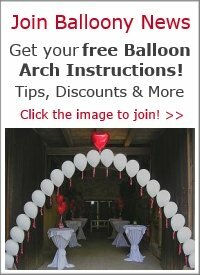 If you find it difficult to create and attach the balloon clusters to the column or arch frame, try using balloon rings (also called balloon connectors). They are easy to use and fit over a 1/2" pipe. 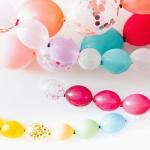 You can get the balloon rings in packs of 20 at Amazon. As in Step One, take four 11" balloons, two of each color, the only difference being that these four will be under inflated to 8". 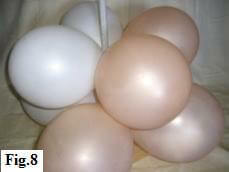 After inflating, tying and twisting, again you should have a cluster of two opposing colors. 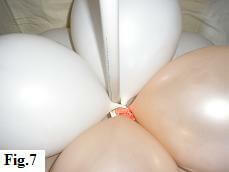 Now put this cluster in position, with the conduit between the two white balloons (fig. 7). From this point you will be working from left to right, in other words, each new cluster will rotate 90 degrees (or one balloon) to the right (fig. 8). That's the foundation complete, now it's time to move on to the middle and top parts of your balloon column.